Whether your baby is ready to walk, or just kicking back in the walker, super cute babies' shoes are a wonderful addition to any outfit. 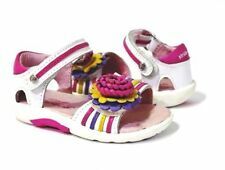 From adorable baby boots to cool baby adidas sneakers, find footwear to make your baby's first €€steps special in the vast inventory on eBay, where sellers offer new and used products at deep discounts. 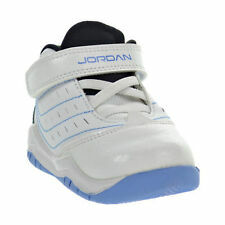 Crib shoes are a cool way to dress up your newborn for visiting relatives, or for heading into town to do some shopping. 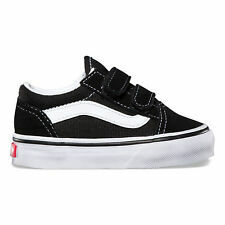 They are lightweight and comfortable, and babies wearing popular brand names such as Nike and adidas, are sure to be the coolest kids on the block. 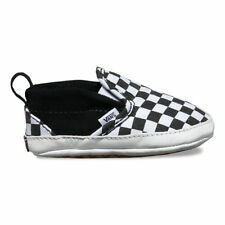 All the big-name brands offer baby shoes. 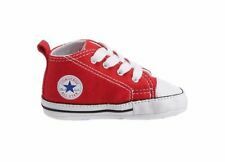 Give your little one some baby Converse sneakers to complement a sports coat and baseball cap, or choose some baby Nike sneakers for your future athlete. When it comes to first steps, stride rite shoes are the perfect choice. Their rounded soles, super flexible design and memory foam footbeds make them ideal for the transition from crawling to toddling. When the sun is out, your baby probably wants his or her toes out too. A pair of baby sandals is easy to put on, lightweight and comfortable. They are the first choice for a hot day, but if there's a sudden downpour, sandals dry out quickly and are less uncomfortable when wet. Most sandals have adjustable Velcro straps, which makes them easy to fit on a wriggling baby, or to adjust for optimal comfort. Some cute winter warmers keep tiny toes snug when the snow begins to fall. Consider some baby Uggs, which have a thick fleece lining and a comfortable fit, or look for high-topped boots, which are a great option for jumping through snow drifts or splashing in puddles.